Successful business professionals know how important a project management board is in managing a project and guiding its way to completion on time. Communicating project time, tasks, goals, milestones and overview 24/7 is easy with these whiteboards. Being able to visualize the life cycle of an entire project is a vital part of its success. Smart project managers make sure everyone can see the project status overview with details of each line-item's timeline milestone. They know that seeing all the information, the next steps in the process and prioritizing the different parts helps to maximize efficiency and keep all tasks organized and running smoothly. When managing multiple projects at once, it could be beneficial to have a (project management whiteboard) that will keep track of the status and progress of each. By being able to view each together on the same board, it will be more convenient to compare them and set priorities for individual assignments when needed. By using our project whiteboards it will be easy to list out all major requirements for multiple projects at once, allowing the teams involved in tackling the task to keep their focus and have a clear interpretation of the steps ahead. Our products work in a variety of fields and industries and for managers of all types. 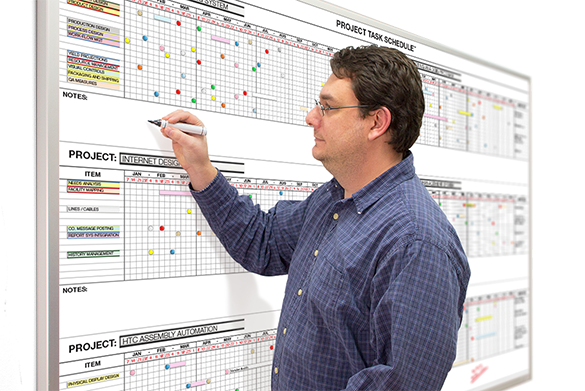 Our clients in the past have used these project whiteboards in anything from keeping track of inventory in engineering, to planning out a doctor's surgery schedule for the near future. When you are in the market to buy a project management board, Magntatag is the leading source for everything you will need to ensure that your company and employees are focused, and all projects are organized and set up to succeed.